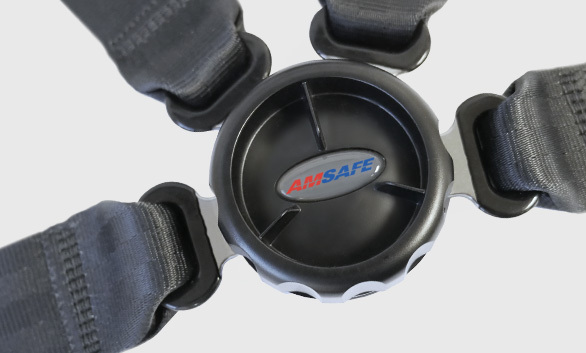 Nearly every major helicopter and aero-medical component manufacturer uses AmSafe crew and passenger restraints. AmSafe has delivered thousands of helicopter crew, passenger and EMS patient restraints over the past 30 years. Users include Leonardo, Bell Helicopter, Textron, Brantly Helicopter, Eurocopter, MD Helicopters, Robinson Helicopter and Schweizer Aircraft. AmSafe’s custom built rotorcraft and aero-medical restraints are specially designed to meet customer specifications. In addition, AmSafe offers a new line of restraint products that meet the unique needs of the rotorcraft and aero-medical customers. These include certified 26g automotive-style, push button restraint systems designed to be intuitive to use, offer increased occupant safety and have easier entry and egress. The polycarbonate option is suitable for applications where durability is foremost. And for high-end corporate applications, the aluminum push button buckle can be plated with a range of finishes for the ultimate three-point passenger restraint.